While dinosaur dandruff and salt-tolerance in tetrapods have palaeontologists excited, the recent auction of fossil bones is a sore point. The oldest known ancestor of the squamates, a group containing all modern lizards and snakes as well as extinct marine mosasaurs, has been discovered from a site in the far north of Italy. Described in Nature (https://goo.gl/EMgcn), the 230 million-year-old reptile, named Megachirella, shows the necessary features in the skull that define it as an early squamate. Being some 85 million years older than previous articulated fossil squamates, Megachirella provides the evidence that the first squamates diverged from all other reptiles just before the beginning of the Mesozoic era. In a separate study announced in Nature Communications (https://goo.gl/vfZaoe), fossil dandruff (corneocytes) on the four-winged feathered dinosaur Microraptor and other dinosaurs and birds in China from the early Cretaceous (c. 125 million years old) has been recognised by superb micro-imaging of surface tissue preservation. The corneocytes were replicated by calcium phosphate to preserve superb detail of the skin texture. The resulting study tells us that dinosaur skin was evolving to cope with this new integumentary feather cover, and the skin consequently needed less cooling. One of the great mysteries of Devonian animal biogeography was how the first amphibians (early tetrapods) managed to become so widely distributed across the globe by the close of that period 359 million years ago. The most advanced fishes leading to tetrapods appeared to live in freshwater habitats (e.g. Tiktaalik from Arctic Canada). 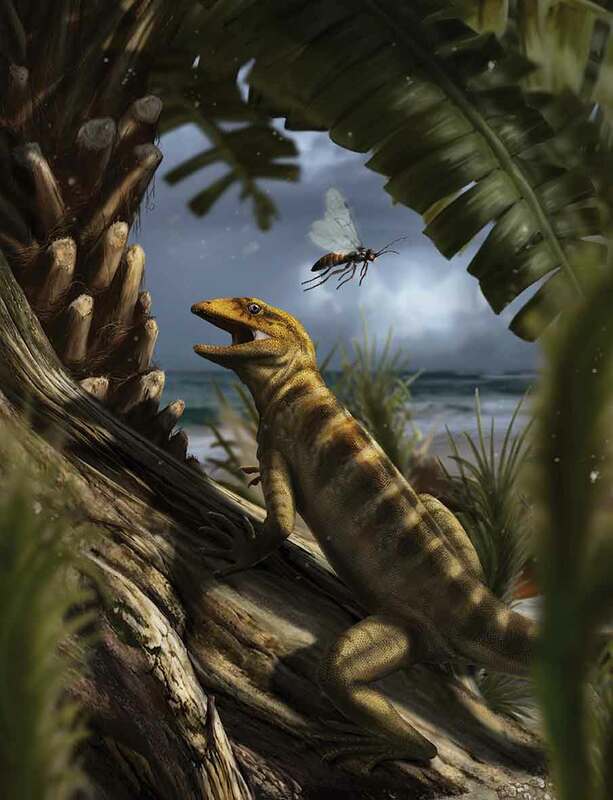 A new study in Nature (https://goo.gl/tu3YaQ) has focused on more than 50 samples of Devonian tetrapod bone from sites around the globe. The research used a multi-stable isotope approach that utilised a new tracer isotope, the sulfur isotope composition of bone sulfates, combined with carbon and oxygen isotopes, to determine the past environments in which the tetrapods and associated fishes found in the same deposit once lived. The study confirmed that these early tetrapods were tolerant of salty water and inhabited deltaic to estuarine environments, so crossing small stretches of open sea to expand their range around the globe might not have been such a barrier to dispersion. The ability to tolerate such highly fluctuating water salinities could have helped them survive a series of biotic crises at the end of the Devonian and pre-adapt them for life on land. And finally a word about that controversial dinosaur auction in Paris, where an Allosaurus-like skeleton from North America sold for USD$2.3 million in June. Touted as a possible new species, no detailed research had been done on the specimen to back this claim. Some of my American colleagues at the Society of Vertebrate Palaeontology (SVP) told me that they suspected it was more than likely just another Allosaurus with media hype being played to drive the price up. The SVP does not approve of vertebrate fossils being commercially sold as it holds that scientifically important specimens belong in a publically accessible collection, like a major state museum, so that any research resulting from a specimen can be tested by future researchers. This is not possible if specimens are held in private collections as they are liable to be bought, sold or traded. John Long is Strategic Professor in Palaeontology at Flinders University, and is Past President of the Society of Vertebrate Paleontology.